Escape the urban bustle at Chapultepec Park and Tepozteco. Your inner history buff will appreciate Zona Arqueologica Teotihuacan and Metropolitan Cathedral (Catedral Metropolitana). 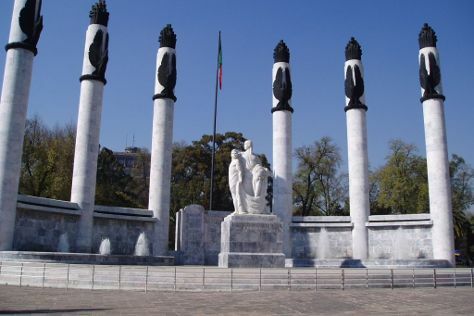 There's lots more to do: get a taste of the local shopping with Coyoacan, contemplate the long history of Basilica de Santa Maria de Guadalupe, see the interesting displays at National Museum of Anthropology (Museo Nacional de Antropologia), and grab your bike and head to Poray Biclaturs & Rentals. To find other places to visit, more things to do, traveler tips, and more tourist information, use the Mexico City online itinerary creator. If you are flying in from Colombia, the closest major airports are Licenciado Benito Juarez International Airport, Licenciado Adolfo Lopez Mateos International Airport and Querétaro Intercontinental Airport. In April, plan for daily highs up to 31°C, and evening lows to 15°C. Finish your sightseeing early on the 5th (Fri) to allow enough time to travel back home.